Give yourself more options for off-road adventures. 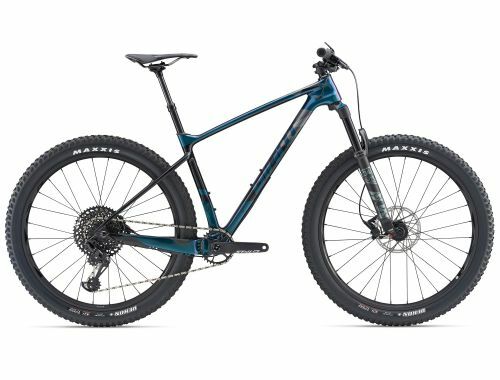 This lightweight composite hardtail features 27.5+ wheels and tires for added grip and control on rugged terrain. As a bonus, you can convert it to a 29er for XC stability and speed. Handcrafted with superlight Advanced grade composite, this versatile hardtail opens up a world of opportunity for off-road performance. In its 27.5+ configuration, you can run oversized tires for confident handling on rough and rowdy singletrack. It can also be transformed into a race-oriented 29er—or even a singlespeed setup*. The frame is designed with quick and stable geometry that’s optimized for a 120mm suspension fork. And it also features wider Boost hub spacing to improve wheel stiffness and maximize tire clearance. * Fork compatibility may vary. Please check with your local Giant authorized dealer.